All fifteen standing moai at Ahu Tongariki, By Bjørn Christian Tørrissen, CC BY-SA 3.0 via Wikimedia Commons. The Rapa Nui, people indigenous to Easter Island, have asked the British government to return one of the British Museum’s most viewed and treasured objects – the iconic stone moai statue called Hoa Hakananai’a. Moai, the giant stone monolithic figures representing ancestors and powerful chieftains, are synonymous with Rapa Nui, as Easter Island is now known. In response to the British Museum’s reluctance to return the statue, one of the museum’s best known artifacts, the Easter Islanders are now proposing that they carve a replica of Hoa Hakananai’a and trade it for the original. 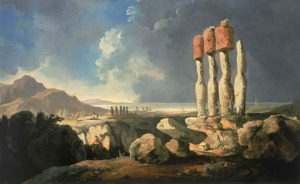 William Hodges, A View of the Monuments of Easter Island, Rapanui, 1795, National Maritime Museum. 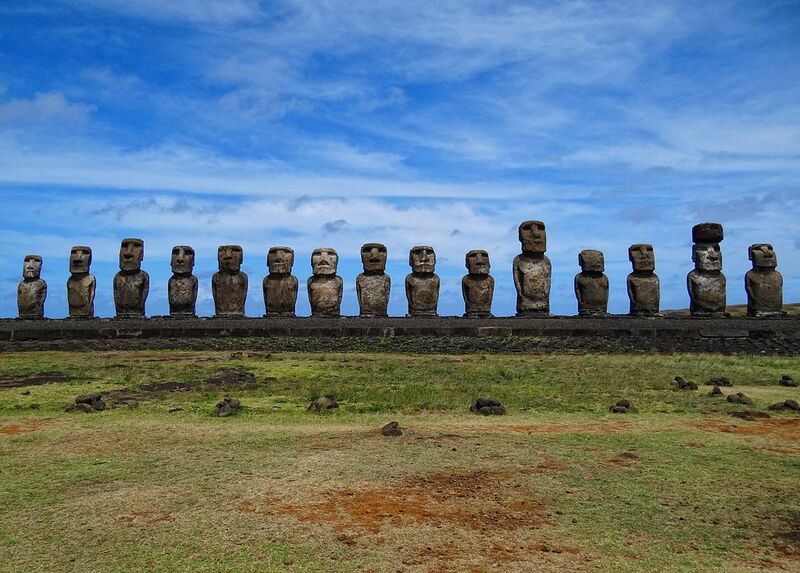 There are over 900 moai located on Rapa Nui. They lie scattered in fields on hilly slopes, and along the island’s sea border. Many are half buried up to their shoulder, by tradition or because many standing moai had fallen or been pushed down by the 18th and 19th century. The statues (often erroneously called “heads” because of their disproportionate size and the fact that many were buried to the shoulders) stand 13 feet high on average; the largest, called Paro, was 33 feet tall and weighed over 90 tons. By the time it was known outside of Easter Island, the moai tradition had faltered, in part as a result of European contact and the rise of another religious cult of Tangata Manu, or Birdman. 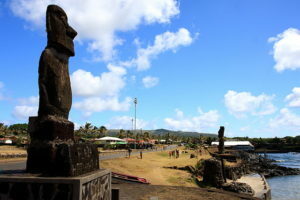 Recently, indigenous pride, recognition of the moai’s importance to the island’s history, and the rise of tourism, have resulted in many moai being raised again, including those originally placed on stone platforms called ahu. These characteristically face inland, away from the sea. Front of the Moai at the British Museum, by Szilas, via Wikimedia Commons. Back of the Moai, by BabelStone, via Wikimedia Commons. Rapa Nui representatives, backed by Chilean National Treasures Minister Felipe Ward, are seeking return of a specific moai, called the Hoa Hakananai’a, which was acquired by the British Museum in 1868, when it was donated by Queen Victoria. Only about 20 full scale moai exist outside of Easter Island, located in museums and private collections abroad. The moai in the British Museum is seen by about 6 million visitors a year, and is one of the BM’s most famous exhibits. Aside from questions of access, study, and the preservational principle of not keeping all one’s eggs in the same basket, the request for its return to Chile raises other challenging issues for the British Museum, one of the world’s great global museums. One key question is about the importance of retaining objects that can instruct a broad audience about the richness and variety of global cultural heritage. Certainly, not everyone can get to the British Museum, but far fewer will ever be able to appreciate Rapa Nui cultural heritage in its original Easter Island location. And the people who do travel to Easter Island will be able to see the Hoa Hakananai’a’s 900 giant stone kin in their traditional cultural environment. The Rapa Nui, on the other hand, point to the Hoa Hakananai’a’s significance as an ancestor of the people, and endowed with a life force called mana. They have said that moai provide protection and the presence of this particular moai on the island may help restore its ecology and the Rapa Nui’s culture. With recent improvements to their heritage conservation infrastructure, they feel they are now in a position to bring Hoa Hakananai’a home and to care for it. 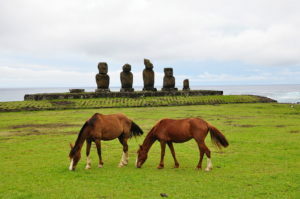 Horses on Easter Island, by Maryatexitzero, via Wikimedia Commons. Experts think that Hoa Hakananai’a was created around 300 or 400 years ago during a transitional time in the cultural narrative of the people of Rapa Nui. In this period there was a transition from moai tradition, involving the creation of giant statues imbued with the mana life force of the ancestors, to Tangata Manu or Birdman tradition, a yearly ritual contest involving the retrieval of the first sooty tern egg from a nearby islet, which decided who should hold tribal authority for the year. There are multiple layers of carvings on Hoa Hakananai’a’s back that suggest its repurposing during this transition. Experts say the more recently carved images are symbolism from the Birdman tradition, the older ones from the ancestor mana tradition. Theories of the evolution of traditions on Rapa Nui have been pieced together using the journals of sailors’ who visited the island and the tiny remnant of oral history that survived the decimation of the Rapa Nui people in the 18th century, first by Peruvian slavers and then by the smallpox. Some material evidence of the transition has also been gleaned from examination of the carved stone traditions of the moai and other carvings. Even prior to European contact with the island’s people in 1722, the Moai tradition was in a period of decline, possibly due to social upheaval resulting from deforestation and environmental degradation and the rise of the newer Birdman tradition. In 1724, a period of intertribal warfare commenced that continued until the 1860s. Then, the arrival of Peruvian slavers in 1862, virtually stilled Rapa Nui cultural life. The slavers captured about 2000 Rapa Nui, including the priests and chiefs that held much of the cultural knowledge. An estimated 90% of the captured Rapa Nui died in Peru. Plaza Hotu Matua, by TravelingOtter, via Wikimedia Commons. 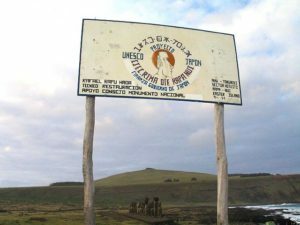 Peru attempted to return the remaining enslaved Rapa Nui three years after their capture, but many died of smallpox en route to their home. The few that survived the journey transmitted the infection to the estimated 1,500 inhabitants still remaining on the island. By 1877 only 111 Rapa Nui had survived both the smallpox, a tuberculosis outbreak and then a forced relocation to other islands. Much of the cultural knowledge was gone. It is not known when Hoa Hakananai’a lost its significance to the Rapa Nui people as part of the Birdman or other cultural tradition. We do know that the Hoa Hakananai’a, was found on 4 November 1868 by Lt William Metcalf Lang and Dr Charles Bailey Greenfield of H.M.S. Topaze on Easter Island. The stone giant was buried up to its shoulders inside a ceremonial stone hut at Orongo, at the Rano Kau volcano, which was the center of the Birdman tradition. At the time, its torso was decorated with patterns in red and white. 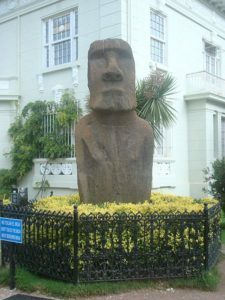 The Hoa Hakananai’a was the first moai taken from Easter Island and according to early sources was describes as a gift to the English seamen by the island chiefs, who were newly converted to Christianity. The Rapa Nui peoples are described as helping to take the moai to the ship in several sources, the most intriguing being on a tattoo that was recorded in 1884, showing Hoa Hakananai’a positioned perpendicular to a rope, being dragged overland to H.M.S. Topaze. 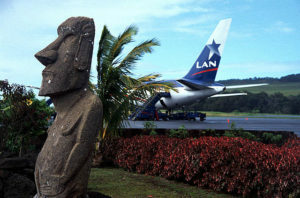 Mataveri Airport, Easter Island, by Jialiang Gao www.peace-on-earth.org, via Wikimedia Commons. Jo Anne Van Tilburg noted in Lost and Found: Hoa Hakananai’a and the Orongo “Doorpost,” that after an “impromptu Rapanui ceremony… nearly all members of what was then a small Rapanui community—collected Hoa Hakananai‘a from the ceremonial village of Orongo,“and helped to transport the figure to the ship “as a trade commodity.” Hoa Hakananai’a is also described as a gift to Queen Victoria. In the decades following Hoa Hakananai‘a’s removal to England, the British-Tahitian plantation owner Alexander Ariipaea Salmon purchased the majority of lands on Easter Island and developed a tourist trade with passing ships. Throughout the 1880s, British, German and American archeological expeditions conducted research on the island and in 1888 Salmon sold his holdings of Rapa Nui to the government of Chile. Moai, Viña del Mar, Chile, via Wikimedia Commons. Chile declared Rapa Nui a Chilean National Monument in 1935 and created a National Park there administered by the National Forest Service of Chile (CONAF). Since 1995 Rapa Nui National Park has been a UNESCO World Heritage Site covering 40% of the island of Rapa Nui. The park includes over 900 Moai, most of which have been placed back on the more than 300 ahu ceremonial platforms along the coastline in the traditional positioning – facing away from the water. The park also includes the most visited site on the island, Orongo, the original home of Hoa Hakananai‘a and its fifty-three ceremonial structures dedicated to the Birdman tradition. Why a Repatriation Request Now? The Rapa Nui National Park was placed on the World Monuments Watch list in 1996 and again in 2000 due to concerns over lack of conservation and care for the site. Since 2001, extensive efforts have been made to develop Orongo and restore its ceremonial structures through funding by the World Monuments Fund and American Express. A new visitor center, the Centro de Recepción de Visitantes de la Aldea Ceremonial de Orongo, was built in 2011. There is also a museum on Rapa Nui, the R. P. Sebastian Englert Museum of Anthropology, which supports research and conservation efforts. The improvements to Orongo and the museum’s development of a cultural infrastructure to support its conservation prompted local interest in the repatriation of the British Museum’s Hoa Hakananai’a. Moai Protection sign, with moai in background. Uploaded by AlbertHerring, Flikr, via Wikimedia Commons. 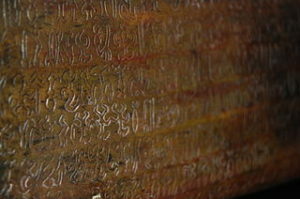 Rongorongo script, photo: Msdstefan, via Wikimedia Commons. Representatives Rapa Nui are planning to propose to the British Museum in a meeting at the end of November that they hand carve a replica of Hoa Hakananai‘a to swap with the original similar to proposals that the British Museum has rejected in the past with regard to replicas replacing other key works in the museum, such as the Rosetta Stone and the Elgin Marbles. Hoa Hakananai‘a was the first moai to leave Rapa Nui, but it was not the only one. 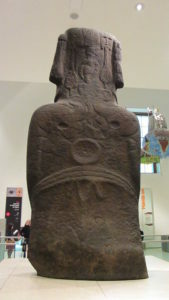 Another moai, now also at the British Museum, traveled on H.M.S. Topaze to England as well. It is estimated that there are 79 complete moai, heads, torsos, pukao (red stone moai hats), and figurines scattered around the world, including two in mainland Chile, one in Brussels, eight at the Smithsonian Museum in Washington, and others at the Musée de l’Homme in Paris and the Otago Museum in New Zealand. There are also other Rapa Nui cultural objects in collections around the world, including records of a form of writing called rongorongo that can no longer be read. These objects, as well as the iconic moai sculptures, have inspired worldwide scholarship as well as creating a positive popular understanding of the importance of the stone carving of Rapa Nui in the development of Polynesian culture. The British Museum and other holders of Rapa Nui cultural objects must seriously consider the conditions that the object will be returned to.when there is a request for repatriation. Rapa Nui has done much over the last two decades to conserve, study and restore the island’s cultural heritage, but they may be in a race against time and the forces of nature. In July New York Times correspondent Nicholas Casey and photographer Josh Haner clearly documented the threat to the island’s heritage in their article Easter Island Is Eroding. The article revealed how multiple sites around the island are currently threatened by rising seas and violent storms. There is a question whether the conservation community will be able to respond in time. and “Lost and Found: Hoa Hakananai’a and the Orongo “Doorpost“,” Jo Anne Van Tilburg, The Journal of the Polynesian Society, Vol. 123, No. 4 (DECEMBER 2014), pp. 383-397, Published by: The Polynesian Society.